With flu season waning and allergy season on its way, it’s important to keep in mind how to properly dispose of unused and unwanted medicine. 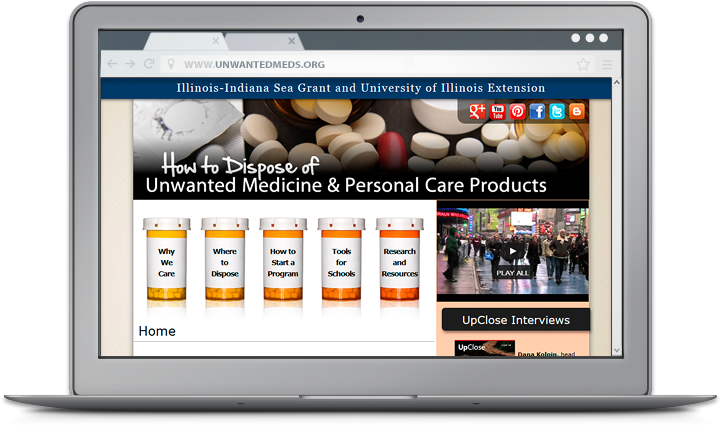 IISG’s Unwanted Meds website explains the dangers of flushing or throwing away pharmaceuticals and personal care products (PPCPs) and provides information, tools, and resources to help individuals, communities, and educators protect aquatic ecosystems. The award-winning site contains information on collection programs and events for the Great Lakes region and beyond, as well as a list of commonly accepted and unaccepted items. Instructions for alternative disposal methods are also included for individuals without access to collection programs. And visitors looking to prevent PPCP waste will find tips and resources for reducing the amount of unwanted medicine in their homes as well as avoiding personal care products with potentially harmful chemicals. Local decision makers can take advantage of a free toolkit with instructions for how to safely and legally conduct their own collection program or event. And educators can get help incorporating pollution prevention into their teaching with resources like The Medicine Chest and The Prescription Pill and Drug Disposal (P2D2) Program. In addition to tips and tools, Unwanted Meds is also host to the latest information on the science behind PPCPs. Its Rx for Action blog discusses leading research on everything from where pharmaceuticals have been detected to how these chemicals impact wildlife to new technologies for removal during wastewater treatment. Readers can also go behind the scenes with the scientists working to make sense of this complicated topic with the UpClose interview series. For the last information on PPCPs and other emerging contaminants, be sure to follow our pollution prevention team on Twitter, Facebook, Youtube, or Google+.